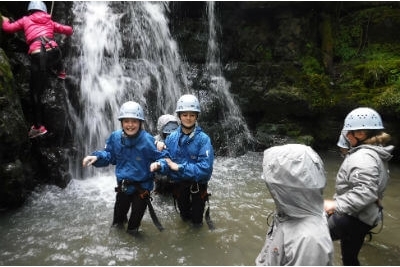 We welcome all youth groups such as Scouts, schools, language schools and colleges to try our adventure activities. Whether you're organising a one-day activity, a weekend away or are planning an adventurous expedition in the area experiencing a variety of outdoor adventure activities. We can help with multi-adventure activities and with camping residential trips - a favourite is a five-day guided open canoeing expedition on the River Wye. Inspire2Adventure has excellent experience of working with youth groups. We recognise that your group may be of mixed ability and that some young people will be less confident than others. Our instructors know how to support and encourage, and the greatest reward is to see every participant grow and discover just what they are capable of. Taking responsibility for a group of young people participating in physical activities is not to be taken lightly. We fully understand the need for risk assessments and so we're very happy for youth group leaders to meet our team and try the activities before bringing groups to the area. Inspire Consulting & Coaching Ltd t/a Inspire2Adventure are AALS licensed registration no. L13797/R1293 and hold public & liability insurance. Please call us now 01600 891515 or email to discuss plans for your youth group.